Seattle Central is pleased to provide a state of the art housing option for international students: The Studios on Broadway! The Studios on Broadway are conveniently located directly across from Seattle Central College, and only blocks away from shops, restaurants and movie theaters on Capitol Hill, one of Seattle's most vibrant neighborhoods. Residents will have easy access to 5 different bus lines, and will live within walking distance of downtown Seattle. Immediately behind the Studios on Broadway is Cal Anderson Park, which boasts a baseball / soccer field and city tennis courts. The building offers 28 furnished apartment units and houses up to 79 residents. Some of these units have beautiful views of Mt. Rainier. Facilities include laundry rooms on each floor and optional parking, available for an additional fee. The Studios on Broadway offer a range of apartments to suit your budget and lifestyle. Apartments come in a variety of sizes and floor plans, and can accommodate as few as two people, or as many as four. Sample studio floor plans are for illustration purposes only. 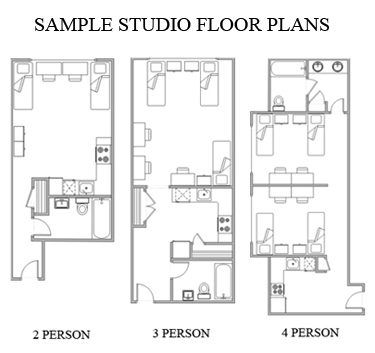 Actual studio floor plans vary from unit to unit. All units come furnished with a bed, desk, chair, and clothes storage unit per person. Apartments also feature high speed internet service, and can also be connected with phone or television service by request. Like a typical studio apartment, each unit has a main room to serve as a shared living space and sleeping area with a window. The studios also include a kitchen with stove and refrigerator, a bathroom with shower, and a storage area. The Studios license fee does not include a meal plan but each room has a kitchen, and the Studios are within walking distance to grocery stores and restaurants. Residents can also eat at on-campus restaurants and cafés during college operating hours. •Quiet Hours will be in place 24 hours a day, 7 days a week. •All noise (television, music, talking) must be maintained at a low level which is undisruptive to other Quiet Floor community members. •Guests are allowed in Quiet Floor rooms. However, guests must abide by Quiet Floor guidelines. If they do not, the host will be held responsible for their behavior and guests may be asked to leave the floor or the building. •Residents agree to confront each other for noise violations. •Consideration for others is essential on the Quiet Floor and forms a basis for a cohesive, supportive community. If you would like to stay on the Quiet Floor, please indicate that on your Housing Application. To enhance the overall living experience, a staff of student Community Assistants is also available on-site. Community Assistants are a group of paid student leaders who are responsible for assisting residents with getting used to living in the Studios on Broadway, answering questions, helping with check-in/check-out, and responding to resident concerns. The Studios on Broadway are intended to provide short-term housing for new international students when they first arrive in Seattle. Students are able to live in the Studios on Broadway for specific license periods. During each license period, information and resources are provided to residents to help them find and transition into permanent housing. For more information about cost, please visit our financial information page.